Scallop vessels range in size from 70 to 100 feet in length. The crew size is typically limited to 7 men including the Captain. Scallopers fish year round in all kinds of weather. 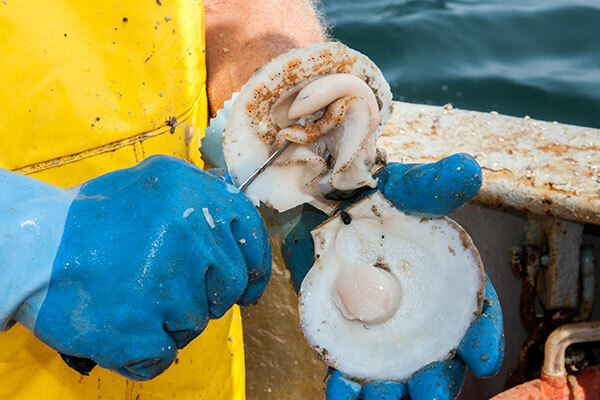 Each trip can last anywhere from 10 to 14 days, but most scallop vessels are now limited to a total of approximately 30 open area days for the entire year and several closed area trips with a 17,000 pound limit. In winter, boats tend to fish in the Mid-Atlantic area where it is warmer and a little bit safer. 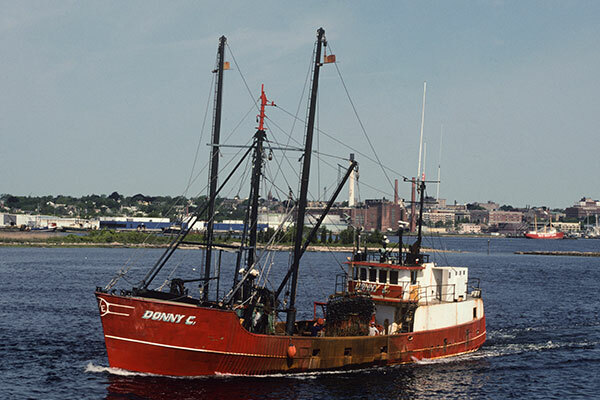 Scallopers from New Bedford typically fish in one of three areas: East of Cape Cod in the Great South Channel, on Georges Bank, or in the Mid-Atlantic region from New York to Virginia. The ocean floor varies from one area to another. In the Great South Channel it is notoriously rocky and fishing there is extremely hard work! Georges Bank is a mix of smooth and hard bottom, while the Mid-Atlantic is known for its smooth sandy bottom. 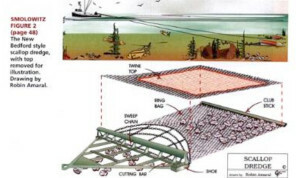 Scallopers generally work in depths ranging from 20 to 50 fathoms (120 to 300 feet) where scallops are most plentiful. After steaming to the fishing grounds, the dredges are deployed off the sides of the vessel. Vessels use steel dredges that are 10 to 15 feet long with an opening that is approximately 16 to 18 inches high. 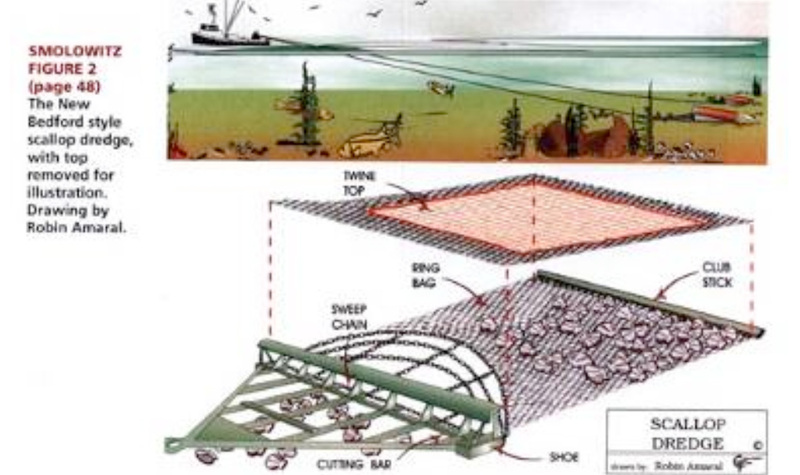 As the dredge glides across the bottom, scallops are swept through the opening and fall into the chain bag made up of steel 4-inch diameter rings. 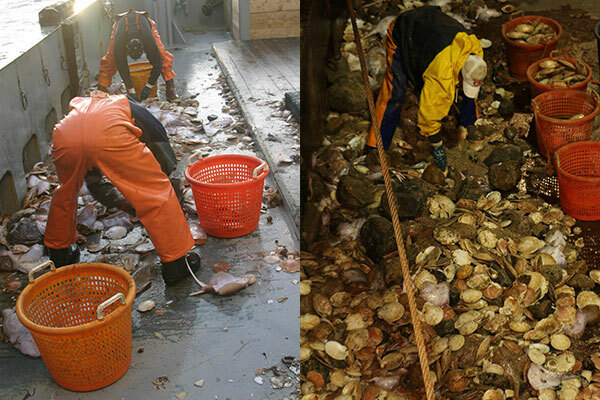 When the gear is hauled back, the scallops are dumped on the deck. 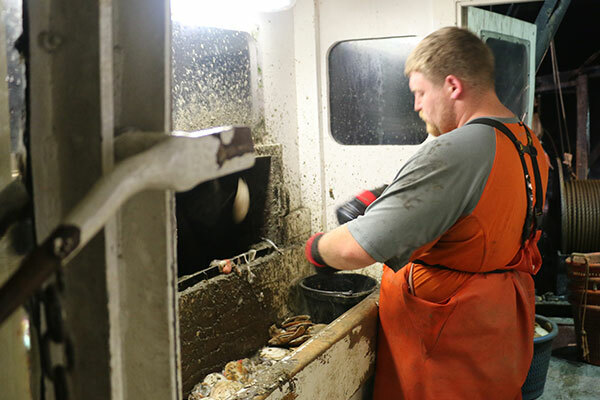 The crew “picks the pile,” tossing scallops into bushel baskets and rocks and incidental catch overboard. Scallops are hand-shucked into buckets, rinsed, and placed in special muslin bags, tied off with wire. The 50lb bags are stored on ice in the fish hold. 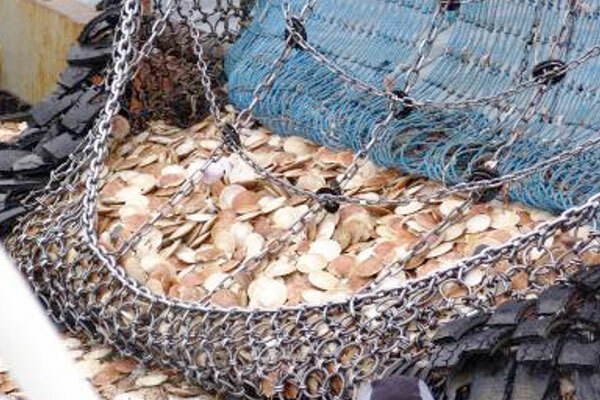 On a 10-day trip, a single fisherman will shuck some 50,000 scallops.